About One of todays shots. I was stuck behind a large wire fence and the majority of the area was in shadow from a large pavilion. Unfortunately this threw a shadow across the man. Hey, there's my cinderella. How are you doing babe...except for being completed snowed under with catching up. Don't worry, be happy. You will get through them all soon. Fabulous! Congratulations on the award. In fact, I think the shadow works as a metaphor for overcoming one's fears! The action is freezed greatly ..! Also i like the sunlight coming from left ! Oh,dynamics,dear Judi,nice and fortunately spot lighted at the players face and balls.Thanks many comments on mine. Wow....thanks so much Allen. I am pleased you like this series. I was purusing your lates submissions to see which one "jumped" out at me (no pun intended). I can see why this won Staff Choice. Good work Judi. Thankyou so much Fadel. There are some humourous ones yet to come. Great action series, and this one is very funny, congratulations on the well deserved award Judi! Great action shot, but the shadow prevents it from being an outstanding image. Thankyou so kindly Luigi. I am really pleased this one received an award. Thankyou so much Roby. I am really happy that this one was recognised. Congrats for Awards, this is merit a great mention. Ok.. finally a well deserved award in sTAFF CHOICE!!!! Aww...thankyou Michael. You just made me feel so proud. Thankyou. That subtle lighting draws attention to the expression and the double arm rock drop! That makes the shot man! Yes, I worked on stop action shots. I didn't use multi bursts but just took one shot at a time. I didn't use a tripod but as I saw them coming for the shot I aimed and prefocused on the basket as I knew that was the rough distance from me that the basketballer would be, then I recompsed the camera to capture the basketballer and as he came into the frame followed through with the shutter. There is absolutely no cropping on this image, so what you see is what I took. Okay, with copying the stats it is a bit fiddly. 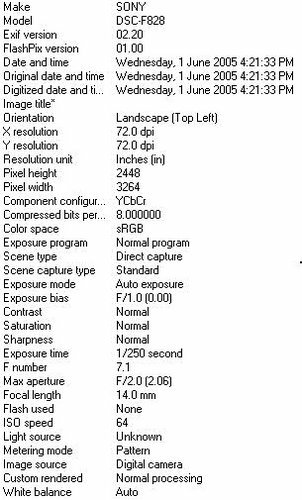 Open up PSP and open your image, then go to Image/Image Information and click on the EXIF tab. Leave it open. Now open up PSP again and it will open in another window. Yes, it will. Now you will notice your curser is a cross type symbol. Move your cursor to the top right of your EXIF screen and right click once. This will trigger the snapshot action. Without moving the cursor left click once and then move the cursor to the bottom left of the EXIF info. You will notice a square is being drawn around the info. Left click once and you will usually be taken straight back to your second version of PSP. If not just click on the second version PSP window and you will see your snapshot there. You will have to do three snapshots of the EXIF info as you cannot scroll down whilst doing the snapshots. When you have captured all the info go back to the second version where your snapshots are and copy and paste them into a new document and arrange them correctly. Now crop around the information and save it using the file name matching the image but put EXIF after it so you know later when you are viewing that folder that it belongs to the particular image it is next too. Yeah kind of. I don't know what they are called but they are large square gaps in the wire fence. Enough to stick the lens through. Of course you can follow me around....but you will need to have energy as I work quickly. LOL!! After reading the comments above and sports shots I have done in other years, it looks like a lot of these shots are at the instant of the guy's motion, which in effect stops him for that instant, right? I see in your stats here the 1/250 @ 2.8 @ISO 64. Apparently you were on your tripod. Would think manuel focus, but about where...the basket area, or a bit closer?? 24 FPS (movies for training). And once again buddy, how do you copy/cut/paste the stats in this manner? It would help me going back through my work to compare from camera to camera, shot to shot etc. You don't mean a chain link fence do you?? It must have been one you could shoot over, no?? great capture judi !! love the detail and presentation .. cheers .. marky . Caught right in the act..fantastic! Thankyou so much Kel for all of your wonderful comments. Thankyou so much sweetie for all of your wonderful comments on my images. Thankyou so much for your wonderful words my friend. I have attached the settings for you. I hope they help Al. Oh, I wish!!! Thanks Roberto. Thankyou so kindly my friend for your comments. Thankyou Ameed. I am pleased you are finally getting to see my work. Hehehehe...they are a stunt team that use mini tramps to get the height. And with some of the jumps they did...they definitely needed it. The weirdo basketballer in my next image had many close calls, including landing on the upturned mats between his legs....OUCH!! The shadows make this photograph more telling, Judi. It's alive. Very well captured, my friend. Congratulations! wow. wow. bravooooooooo dear Judi what a brillant capture. Ooooh!!!! what a shot ! Judi! Imagine the serendipity of the shadow. It adds depth and contrast to the vivid color. The image emotes and palpable sense of inertia and power. Very very strong Judi. A great action shot, Judi, and I think the shadow makes it that much more dramatic. This is great Judi, can you tell me what you'r settings were, i have been trying to capture my daughter at gymnastics but don't seem to get just the right setting still get to much blur. Amazing capture Judi!!! Great skills for capturing the moment. You are so talented! but the shadow don't disturb at all, and instead adds something like a 3D effect. well done again, sweet lady from Australia.. I like the composition, light and the guy's expressions. Very beautiful, dynamics, spectacular. . . . . . .
Wow Judi.....eccezionale cattura, bellissima anche l'espressione del volto della persona, bravissima!!!!! I like it, in my the shadow doesnt hurts. The shot is simply wonderful. Another perfect exposure, Judi. Great expression on his face. It really makes the shot work. 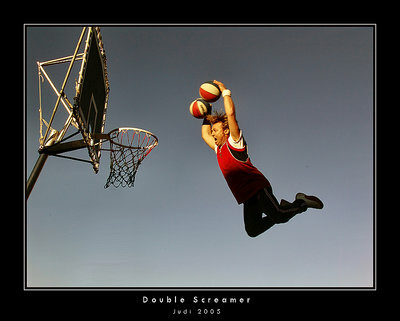 Sports photography may be your other niche in life. Excellent! I love the shadow on the man, it seems to draw more attention to his screen and the rim of the basket - the focal point of the photo. I agree with the other - SPLENDID!!! Look at his face ;) GREAT Judi! Great timing for a good action shot. How did this bloke jump up so high??? I love this game.A very good action. Excellent capture. Nice composition and tones. Wow.. great honor for me Judi!! Thankyou so kindly sweetie. Your words are important. Thanks Erkoc very much. Your words really made me look at the image again....and I can see what you are saying. I was actually looking at the image in a totally different way. Thankyou so very much for pointing that out to me. I am so tired...LOL!! So thankyou for helping me. Don't be so sorry about the shadow..The shadow makes this incredible capture more intersting..congrats..
...fantastic Judi...free in the air!!! amazing shot.. I LIKE IT VERY MUCH .. Terrific! A very good shot Judi, very well done. The image is very clear, no blur because the movement. Bel fermo immagine. Uno scatto che trasmette in pieno la dinamicità dell'azione.